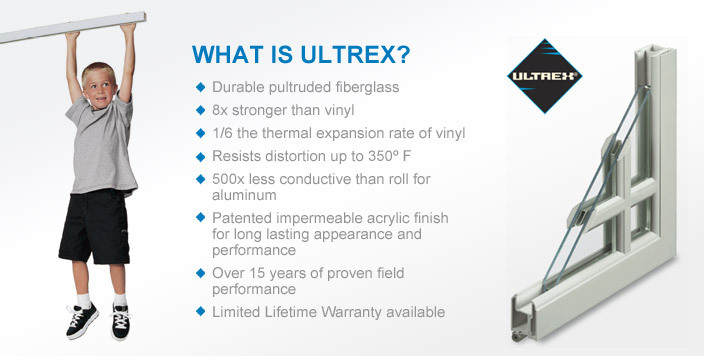 WHAT IS ULTREX PULTRUDED FIBERGLASS? “Pultrusion” combines the words “Pull” and “Extrusion.” Extrusion is pulling of material such as Fiberglass and Resin, through a shaped and heated die. Fiberglass materials used in the manufacturing of Infinity from Marvin replacement windows go through a pultrusion process. Pultrusion is a continuous molding process using fiber reinforcement in polyester or thermosetting resin matrices. Heat is used on the "thermoset" resins, in the fiberglass pultrusion process, to cause an irreversible chemical reaction which permanently sets the shape of the fiberglass window frames. Once the Ultrex is cured, it cannot be reformed; this process is permanent. Pultruded fiberglass materials are made of glass fibers and resins. The glass used in fiberglass, while basically the same core material as that used in flat glass, comes in a different form – rovings – or also known as fibers. This form of glass begins as a finely ground, flour-like material composed of Silica and Zirconia. The "flour" is heated and melted at approximately 1500° C, and the resultant molten glass is passed through small holes forming hair-like filaments. The filaments are collected together, grouped and a binder is applied to bond them into strands. Then the strands are heat cured, wound together and rolled up into a cylindrical package. These fibers provide the bulk of fiberglass profile's longitudinal strength. The majority of resins used for fiberglass window profile are classified as polyesters. Polyester resin is one of a group of synthetic resins which undergo polymerization during curing. They provide excellent adhesive properties, high strength, and good chemical resistance. These high-performance polyester resins are then mixed with suitable fillers and pigments to formulate the resinous matrix. The formulations are optimized for the particular application.